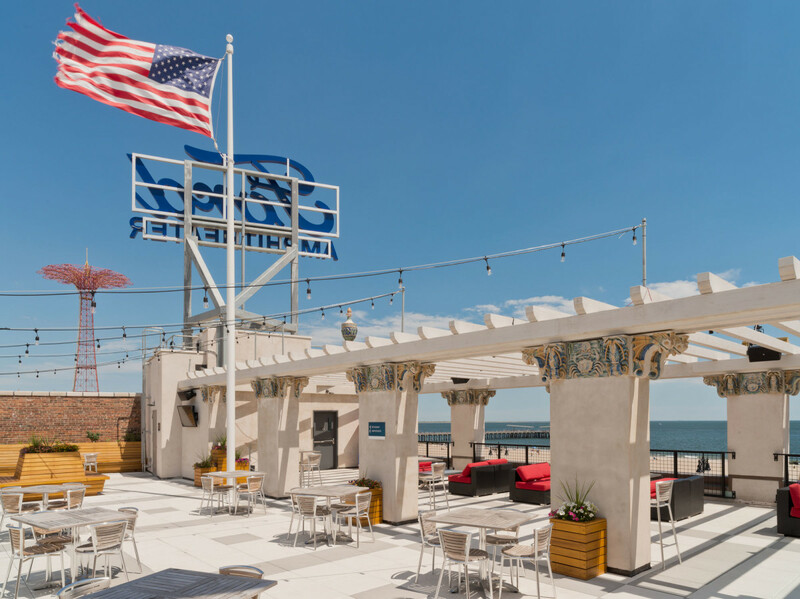 Restored by Gerner Kronick & Valcarcel, Architects, with preservation consultant Diane Kaese, the Childs’ Building on Coney Island, in Brooklyn, NY, has been returned to its original function as a full-service restaurant. 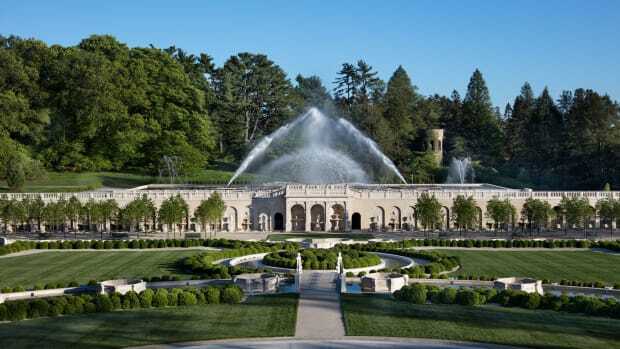 The program also called for the addition of a 5,000-seat amphitheater and the restoration of the fanciful, ornate terra-cotta ornament on the facades. Architect: Gerner Kronick + Valcarcel, Randolph Gerner, AIA, Principal; Joe Barbagallo, AIA, Principal; Silke Rapelius, AIA, Associate Principal; Rachel Oehl, Associate. If you were walking along the boardwalk in Coney Island in the 1920s after visiting Luna Park, Steeplechase and other attractions, you would probably be drawn into Childs’ Restaurant by the open friendly atmosphere and the five large open windows with a baking station located in one of these. You would definitely notice the ornate terra-cotta ornament depicting maritime themes on the facade of the building. Fast forward to 2017, and the building is back as a fine-dining restaurant and bar, with an added amphitheater and rooftop seating. 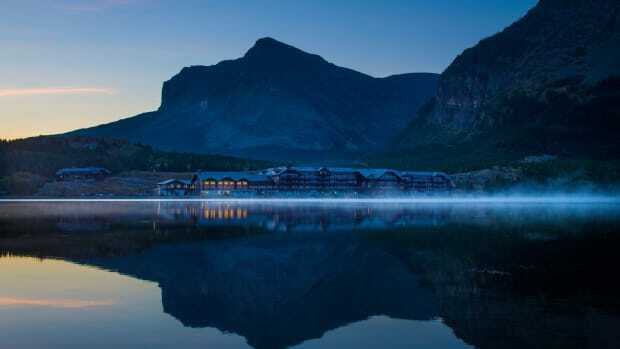 It is no longer a Childs’ Restaurant, but much of the historic building has been restored and brought up to date. One of the first fine-dining restaurant chains in the country, Childs’ was started by two brothers, Samuel S. and William Childs. Noted for cleanliness and quick and efficient service with waitresses wearing white starched aprons, the first location opened in 1898 in the Merchants Hotel on Cortlandt St. in Manhattan. By 1928, they operated 112 restaurants in 33 US and Canadian cities, according to Appetite City, a book by former New York Times food critic William Grimes published in 2010. 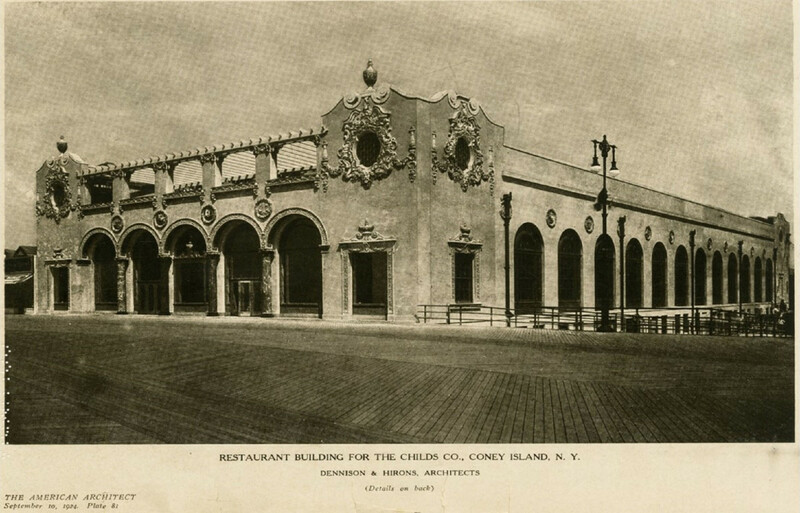 One of the more spectacular locations was the Childs’ Restaurant on the boardwalk in Brooklyn’s Coney Island. Facing the ocean, the 85,000-sq.ft. building was designed by Dennison & Hirons with Spanish Colonial Revival style elements to create a truly memorable structure. The historic building had been abandoned and neglected for many years. It was named a New York City Landmark in 2002. 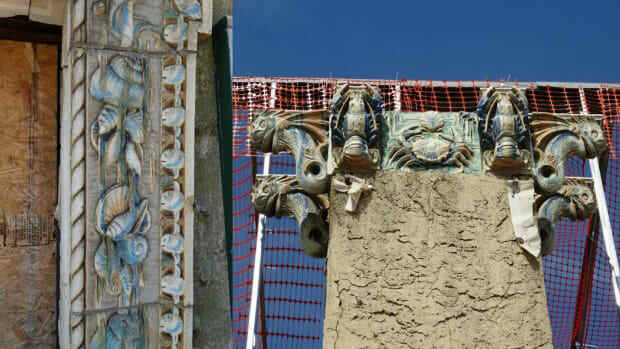 The terra-cotta ornament was designed to look like the building washed up out of the sea covered with sea detritus. The facade was covered with maritime terra-cotta ornament, designed to look like it had washed up out of the sea, covered with all sorts of sea life, both fanciful and realistic. 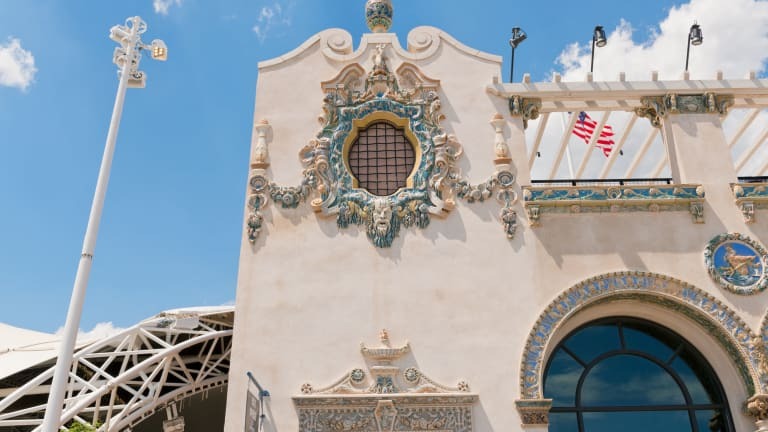 More than 500 multi-colored terra-cotta castings of seaside themes such as sailing ships, rolling waves, seashells, wide-mouth smiling fish and Neptune sculptures adorned the building. The original terra cotta was modeled by Max Keck; the colorist for the project was Duncan Smith. Atlantic Terra Cotta Company produced the terra cotta. The depression in 1930 hit Childs’ as well as other restaurant chains. 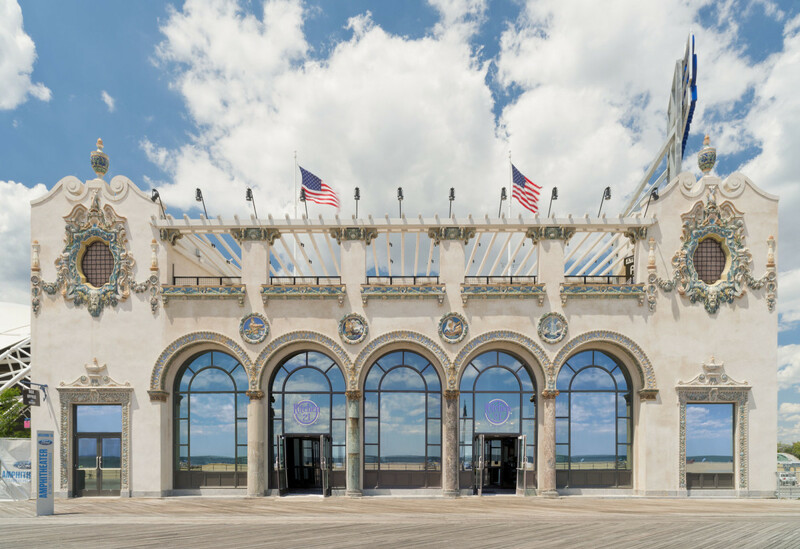 Although they stayed in business a few more years, the chain filed for bankruptcy in 1943 and the Coney Island building was sold to the Ricci family in 1947. 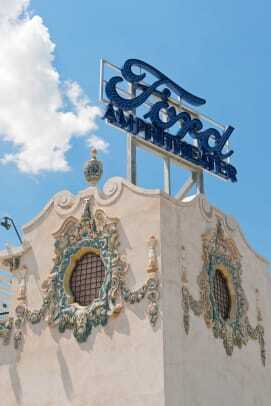 They made minor alterations to the facade of the building and manufactured candy there until 2003. About that time, the building was designated a New York City Landmark. This view of the restored building shows the large (8-ft. tall) arched windows on the boardwalk and east facades, the rooftop pergola, and a bit of the outdoor amphitheater seating area on the far left. In its report, the Landmarks Preservation Commission described it in this way: “Across most of the main facade are five large archways which have been enclosed across their top with stucco and on the lower portion by roll-down gates. 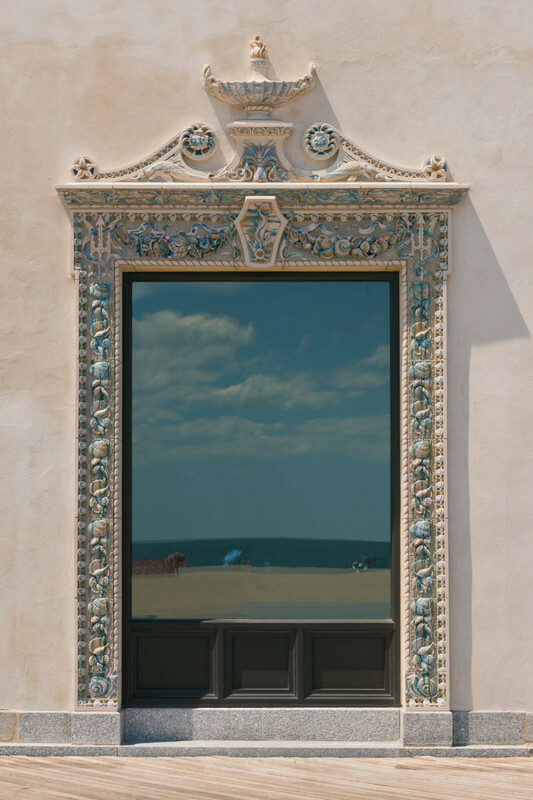 The terra-cotta ornament framing the boardwalk windows after restoration. 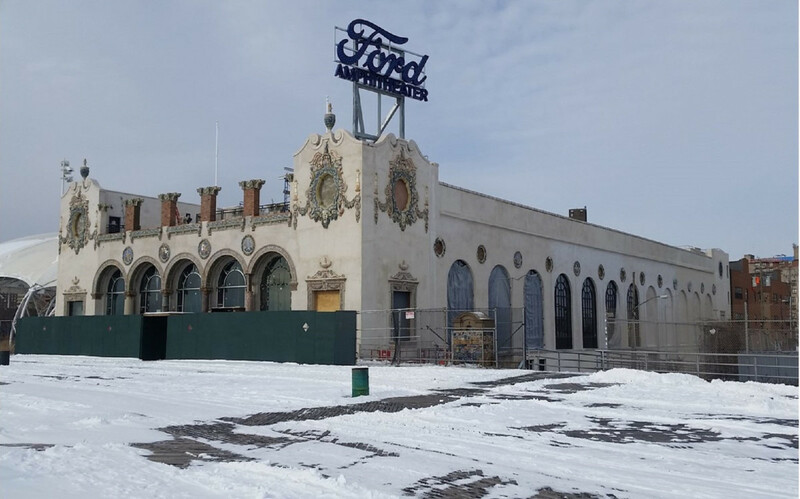 The unique building lay vacant and neglected until 2014, when the New York City Economic Development Corp. partnered with owner iStar Financial and Coney Island USA, a nonprofit, to fund a $60-million renovation of the abandoned, derelict building. 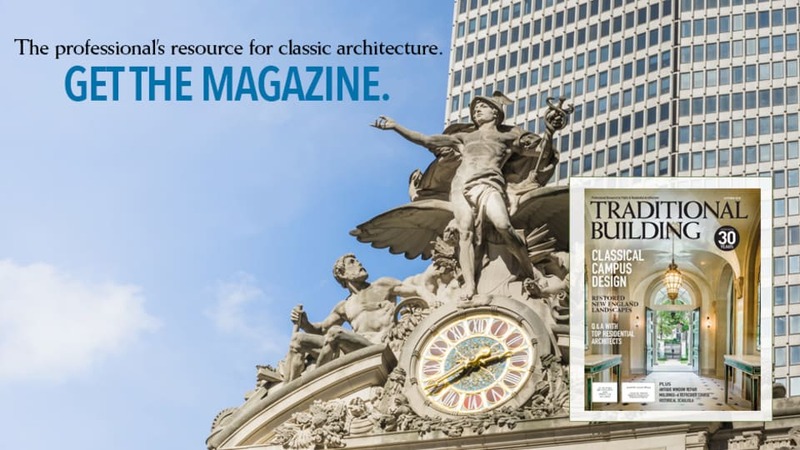 Enter Gerner Kronick + Valcarcel, Architects, a New York City firm with a distinguished record in historic preservation. 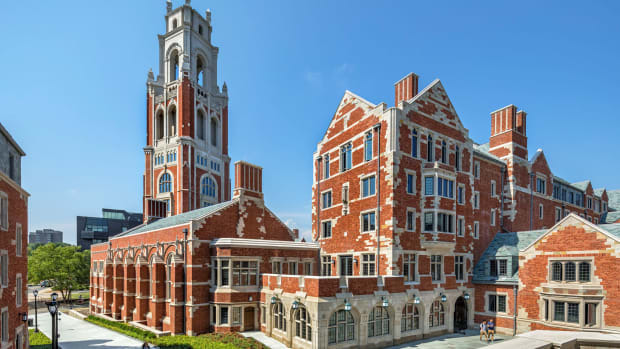 One of their recent projects was the restoration of the Beekman Hotel in Manhattan, a 2017 Palladio winning project. 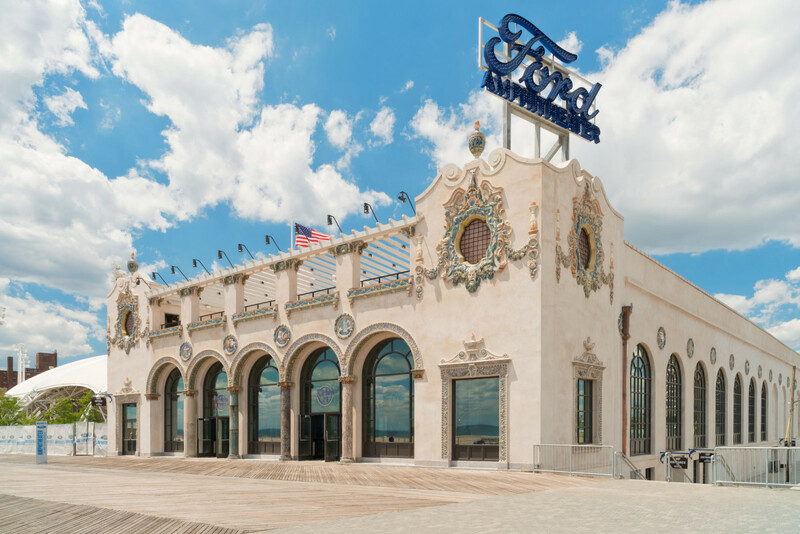 The program at Coney Island called for the restoration of the ornate terra-cotta exterior, a redesign of the interior to again function as a restaurant and the addition of a 5,000-seat covered outdoor amphitheater. The 335 x 100 ft. building is essentially a large masonry box. While the exterior had somewhat weathered the storms of time, the interior had been gutted and little of the original material remained. The design team returned the building to its original purpose as a 2,000-sq.ft. full-service Kitchen 21 restaurant with seating for 400 and a 90-ft. bar. The ground floor below, at street level, provides support services such as a loading dock, offices and restrooms. A rooftop terrace with a pergola was added. To create the new amphitheater and adjacent seating area, the architects removed a portion of the west wall and inserted a stage just inside the building. The stage can be viewed from the restaurant or from the exterior seating, which is shaded with a fabric roof and also provides ocean views. During the winter months, the stage is closed off with large doors. The addition of the stage within the existing building required other structural changes. For example, the stage tower columns had to be threaded down through the existing floor slabs to new foundations. 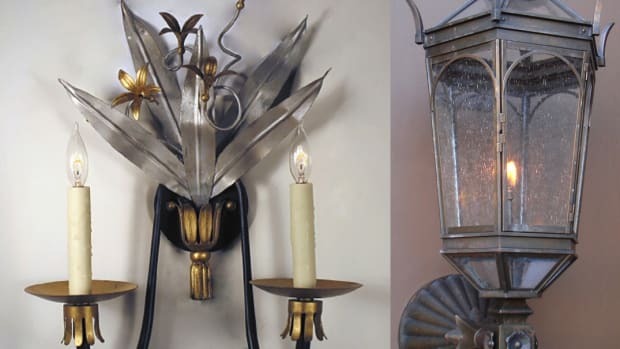 Removing the terra-cotta ornament led to many discoveries such as downspouts and brackets. The ornament included both real and fanciful maritime figures. She explains that many pieces of the original terra cotta could be reused but new cartouches, medallions and the window and door surrounds had to be recreated. 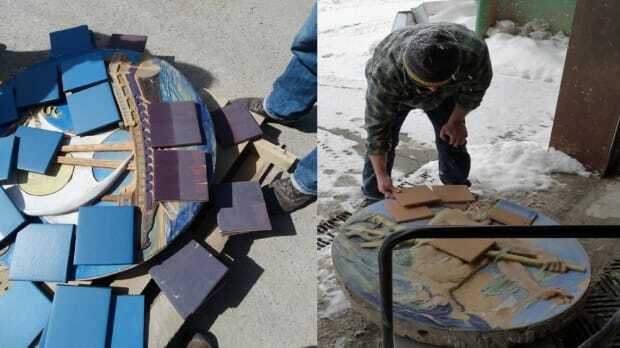 Existing pieces were removed and sent to Boston Valley Terra Cotta to be used as models. “There was quite a bit of algae growth which caused damage over the years and broken pieces due to the rusting of steel elements.” Kaese says. “We also used the salvaged common brick throughout the project including to reconstruct the three-to-five wythe walls that support the terra cotta,” she adds. 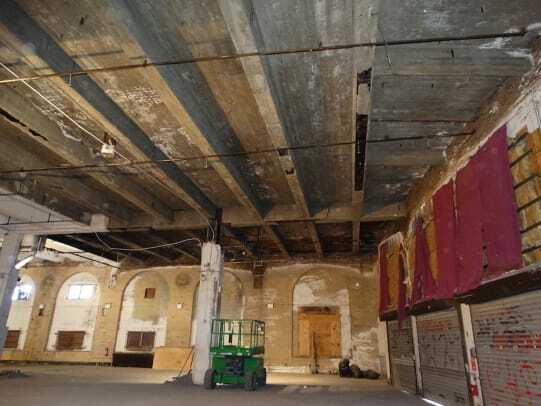 When the 1960s stucco was removed from the south and east walls, numerous cracks and deteriorated steel framing for the roof rafters were revealed. After repairs, new stucco was applied to the south and east elevations, using a standard plaster system made by ConProCo. The color was selected to closely match the sand on the beach. The surface was then finished with a rough wood float to match the original design intent, Kaese explains. Energy efficiency was another goal and it was a challenge because of the large ocean-facing windows. The architects used high-efficiency wall assemblies and glazing to achieve the desired goal and they expect to achieve LEED silver certification. To deal with future storms, Gerner and his team used materials that would be resistant to water and storms. Acoustic draperies were also added to help keep the sound inside the building. The new restaurant and Ford Amphitheater opened in the summer of 2017 after two years of construction. 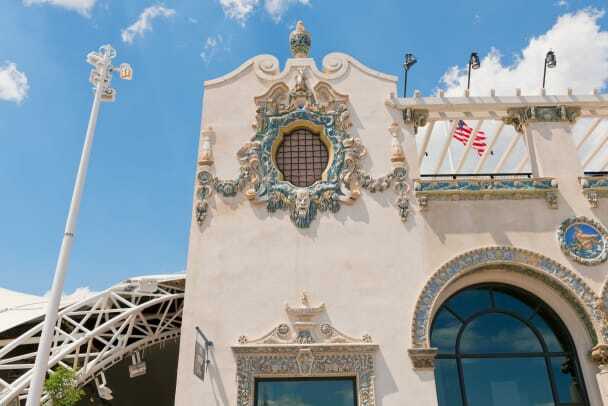 While it is no longer a Childs’ Restaurant, the spirit lives on in the restored fanciful terra-cotta facade, the new restaurant, bar and amphitheater, bringing jobs and new life to the long-neglected west end of Coney Island.